101: (the world’s best) stuffing with Hatfield! Growing up, I was not a fan of Thanksgiving. Specifically, I was not a fan of turkey. As such, the side dishes at the holiday table were always very important to me, as those pretty much comprised my dinner each year. And, each year, I was routinely disappointed. Not that those side dishes were bad, per se. They were made with care and well executed. But it always seemed to me that they were the supporting cast for that star turkey. So when – a number of years ago – I found myself hosting my very first Thanksgiving, I was determined to make the sides as delicious and memorable as the turkey itself. And I did. In particular, the stuffing – the dish that always holds so much promise (carbs! ), yet routinely disappoints. It was such a hit that it was deemed by one guest as “the world’s best stuffing” (!!! ), and the stuffing to replace all other stuffings going forward. I kind of had to agree. So when I had the opportunity to create a holiday meal featuring Hatfield ham, I knew just what I wanted to share with you! All kidding aside, this stuffing truly is delicious. Of course it has lots of toasty cubes of bread (carbs!! ), but so much more. 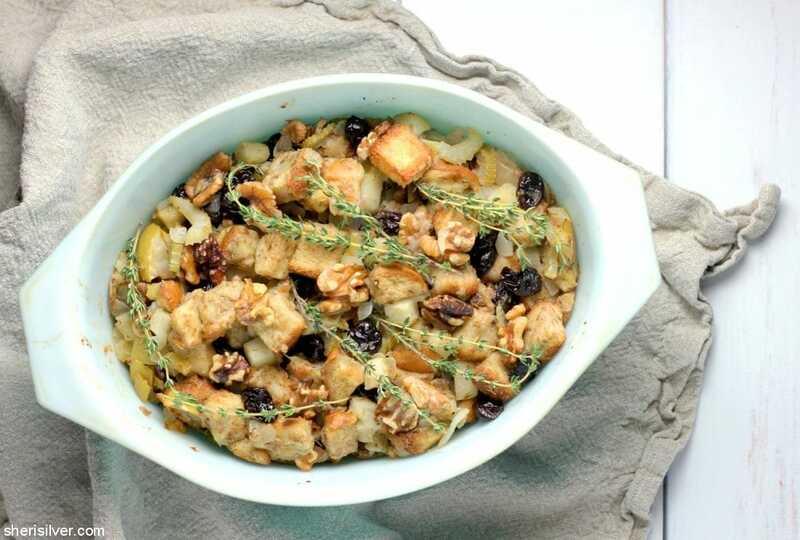 Sweet-tart Granny Smith apples, dried cherries and toasted walnuts, along with plenty of fresh thyme. 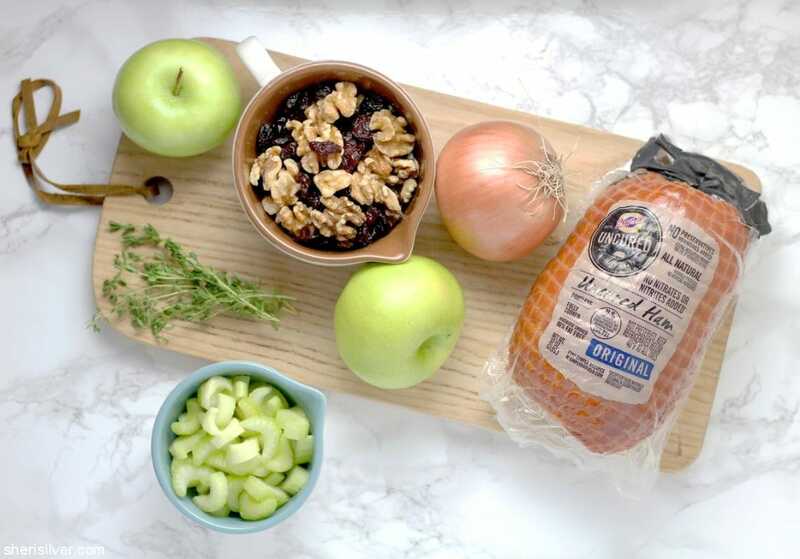 All ingredients are interchangeable too, so sub pears for the apples, raisins for the cherries, pecans for the walnuts or rosemary for the thyme. I was excited to try Hatfield ham as I’m always anxious about cooking whole cuts of meat. But the Hatfield® 3lb. 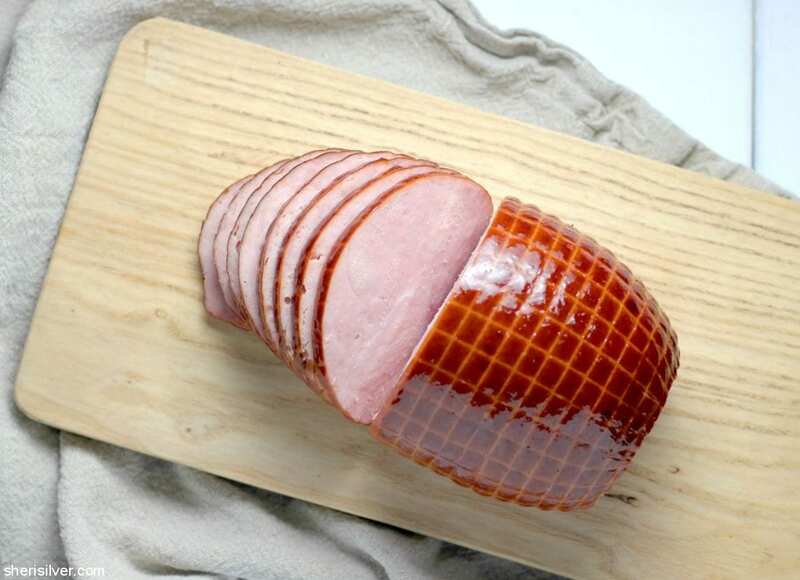 Classic Boneless Ham is full of flavor and already cooked, so it couldn’t have been simpler, making it an ideal choice for any cook – whether new to the kitchen or a seasoned pro. 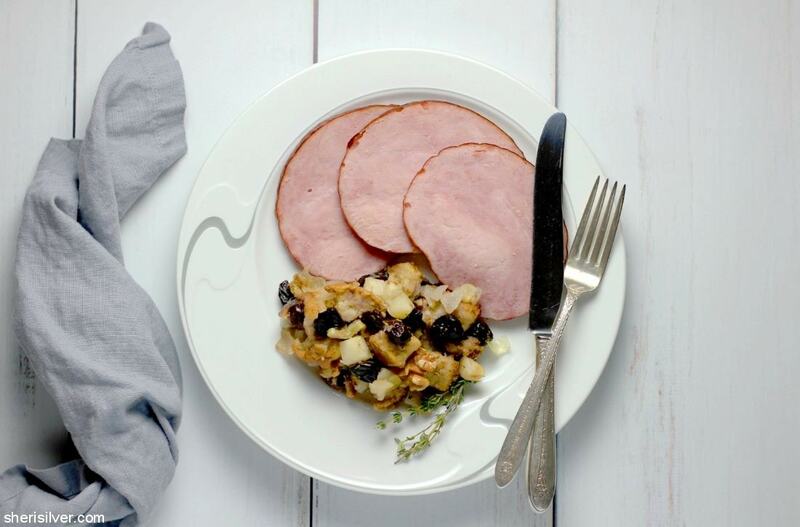 I love that Hatfield makes it easy to serve up a delicious holiday meal – big or small – with their new smaller sized ham products, available in 1/2 Pre-Sliced Pit Ham and 1/4 Pre-Sliced Ham (with Natural Juices or with Water Added). In addition, Hatfield products are family-owned, ethically raised, gluten-free and American-made. And the timing is perfect, since for a limited time only, beginning 10/31/2018, you can receive a $2 rebate upon purchase of any Hatfield Uncured Ham! This stuffing is as easy as it is delicious, and comes together quickly – you can even make it the day before to get a jump on your holiday cooking. And since the Hatfield ham required nothing more than a pop in the oven, I had time to make a quick glaze to brush over it during the last 15 minutes of cooking time. So many holiday recipes assume a large crowd – with serving sizes of 12 – 14. But this is a perfect meal for a “friendsgiving”, smaller family celebration, or even an impromptu get-together during the holiday season. It feels super festive without the need to break a sweat (or break out every pot and pan in the kitchen). That said, this stuffing scales up beautifully so double (or triple) as needed! Pre-heat oven to 250 degrees; grease a 2 – 2 1/2 quart baking dish. Place bread cubes on an ungreased baking sheet and bake – stirring occasionally – for one hour. Let cool slightly. Raise the oven temperature to 350 degrees. While the bread cubes are cooling melt 4 tablespoons of the butter in a large skillet over medium heat. 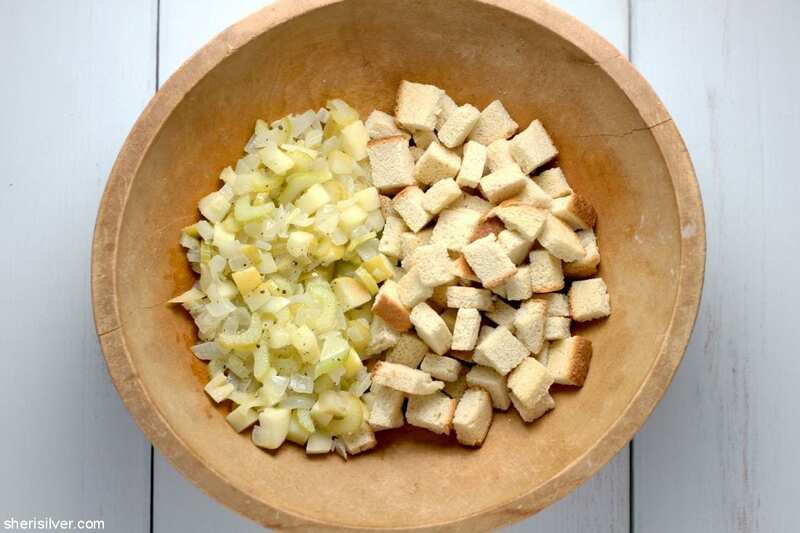 Add the onion, celery, apples and salt and pepper and saute for 10 minutes. Transfer to a large bowl and let cool slightly. Add the bread cubes, cherries, walnuts and thyme leaves to the bowl and toss to coat. Drizzle 3/4 cup of the chicken broth over and gently toss again. Whisk the remaining 3/4 cup broth with the egg in a small bowl. Pour over the bread mixture and stir gently till combined. Season with salt and pepper and transfer to your prepared baking dish. Cover with foil and bake for 30 minutes. Uncover and bake for an additional 15 minutes or till top is browned and crisp. While stuffing is baking, unwrap ham and place in 1″ of water on the bottom of a baking pan. Cover and cook for 45 minutes, or until an internal temperature of 140 degrees is reached. While the ham is in the oven, melt the remaining 4 tablespoons of butter in a small saucepan along with the brown sugar, maple syrup and salt and pepper to taste. Bring to a boil, lower the heat and simmer for 15 minutes. Brush all over the ham during the last 15 minutes of cooking time. Make it vegetarian even better. No ham either. Veggie broth makes it a perfect vegetarian dish!